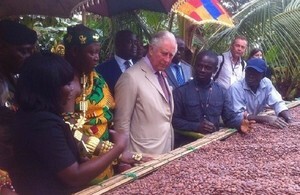 LONDON, UK – HRH The Prince of Wales has visited a cocoa farm in Ghana to see how UK aid is helping farmers across the country to produce sustainable chocolate, create jobs, and reduce the impacts caused by climate change. The cocoa products these farmers produce are being sold to companies selling chocolate bars and sweets in the UK – including Cadburys, Mars and Nestlé. Ghana and Cote D’Ivoire jointly account for over two thirds of global cocoa production, but also suffer from one of the highest deforestation rates in Africa. Cocoa farming is also under threat from increasing temperatures – putting thousands of livelihoods at risk. In Ghana, UK aid is supporting over 70,000 cocoa farmers to become more resilient to the impacts of climate change and therefore better able to cope by using climate-smart cocoa agriculture which can protect against floods or drought. Thanks to UK aid, farmers in Ghana are learning sustainable farming techniques which protect cocoa crops from rising temperatures and the world’s leading cocoa and chocolate companies have committed to working to end deforestation and forest degradation. This project which HRH The Prince of Wales visited today helps to illustrate how our vital support is ensuring the longevity of the cocoa industry for this generation and many more to come. This is a win for Ghana and a win for the UK. The sustainably grown cocoa is also preserving the natural environment in Ghana, the Ivory Coast and Liberia, including critical wildlife habitats of the chimpanzee, and the natural resources local people depend upon. UK aid’s support is expected to lead to almost £100 million of investment by the private sector in sustainable, climate resilience cocoa production – with the potential to create thousands more jobs in the future. The UK is leading efforts bringing governments, industries and communities together to address deforestation in the cocoa supply chain, through the Cocoa and Forests Initiative (CFI). The Cocoa and Forests Initiative, launched by HRH The Prince of Wales in March 2017, sets out agreed actions – by the Governments of Ghana and Cote d’Ivoire, and 35 of the world’s leading chocolate and cocoa companies – to end deforestation and restore forests in the cocoa-growing regions of West Africa. Today HRH was briefed by the governments of Ghana and Côte d’Ivoire and leading chocolate and cocoa companies on progress made in ending deforestation.